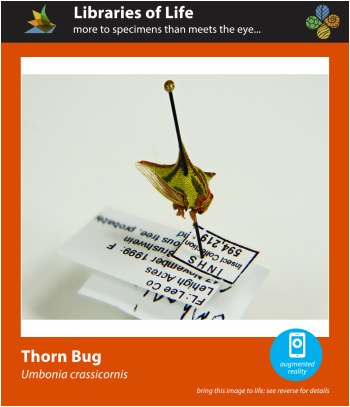 The Thorn Bug: Did you know? Audio: Umbonia crassicornis male searching for a female. During the last bout there is a receptive female that replies to the male's signals. In between bouts you can hear the male walking. Digitized Membracidae specimens in biological collections. 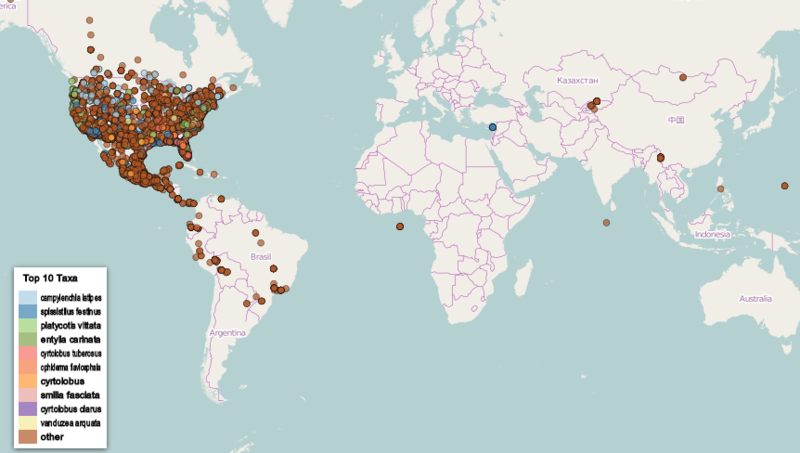 ​Click the map to explore the iDigBio database. The Membracidae family belongs to the insect order Hemiptera (true bugs, leafhoppers, planthoppers, cicadas, aphids, whiteflies) and includes over 3,300 species of herbivorous insects commonly known as treehoppers. Similar to cicadas, treehoppers communicate with specific songs to attract mates, announce the discovery of a new prime feeding spot, or to alert each other to the presence of a predator. Treehopper songs are not audible to the human ear because they consist of vibrations transmitted through the stems of the host plant instead of the air. This process is called substrate vibration, and requires special recording equipment to translate into an audible song. Often similar in appearance to cicadas, treehoppers have a well-developed head and tubular mouthparts equipped with strong muscles for extracting sap from their host plants. Most treehoppers are easily distinguished from other Hemiptera by the extravagant helmet-like structures extending from behind their heads called pronota (singular: pronotum). They are often extraordinarily camouflaged and resemble buds, broken stems, or bird droppings. Crypsis is a common form of mimicry treehoppers employ to avoid detection by predators. Others bear pronota with shapes and colors resembling dangerous organisms like wasps or insect-infecting fungi; some consider these to represent a form of adaptation known as Batesian mimicry. Bright color patterns (particularly red, orange, yellow, and black) combined with pointy pronotal shapes serve to warn potential predators that eating a thorn-mimic treehopper like those belonging to the genus Umbonia will probably hurt--and taste really bad! These kinds of warning signals are a forms of aposematic adaptation (aposematism). Treehopper life histories are as varied as their pronotal shapes, some species are solitary and others live in large groups. Many treehoppers practice parental care to some extent and are variably subsocial. In Umbonia crassicornis the mother communicates to the nymphs to keep them in one place, and will fiercely defend her offspring from potential predators by kicking her legs, buzzing her wings, and charging towards the offender, which can be startling even to humans! Treehoppers and other arthropods (insects, spiders, crabs) are the most diverse and abundant group of macro-organisms in biological collections, but are underrepresented in easily-accessible databases. The InvertNet Thematic Collections Network (TCN) aims to centralize access to and synthesize information from 160 years of North American arthropod museum collections using a robotic camera system to photograph entire drawers of insects and other arthropods. This allows other scientists and the public to access these scientific collections virtually.